Of all the "what ifs" in History, few can compete with "What if the Spanish Armada had succeeded?" The joke might be "We would be speaking Spanish in the U.S." but the reality is much deeper. The Protestant Reformation might have faded early. Colonization of the New World (and the rivalries there) certainly would have been very different. 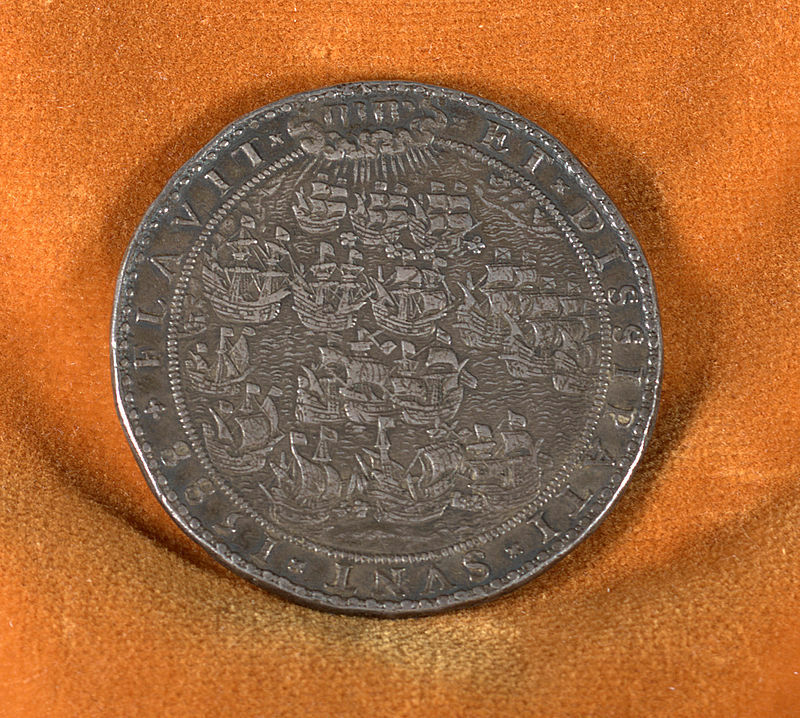 It is hard to imagine what the world would look like today had the Armada succeeded. And yet, looking at the planning and logistics, it is also hard to imagine that the project could ever have succeeded... or hard to imagine it succeeding unless Spanish King Phillip II was correct, when he said they proceeded "in the confident hope of a miracle." This was his answer when the experts kept bringing up significant, even mission-critical problems. And there were many. Still, it was a mighty flotilla, assembled with a mixture of some of the finest warships of the day to impressed merchantmen armed with whatever could be obtained, using new tactics to create a naval sort of battering ram that would not be stopped. While the English Navy created new tactics of their own, it was the use of an age-old weapon, fireships- which made all the difference. Ironically, the fireship attack actually destroyed NO Spanish ships, but the loss of anchors and the scattering of the fleet accomplished far more destruction. 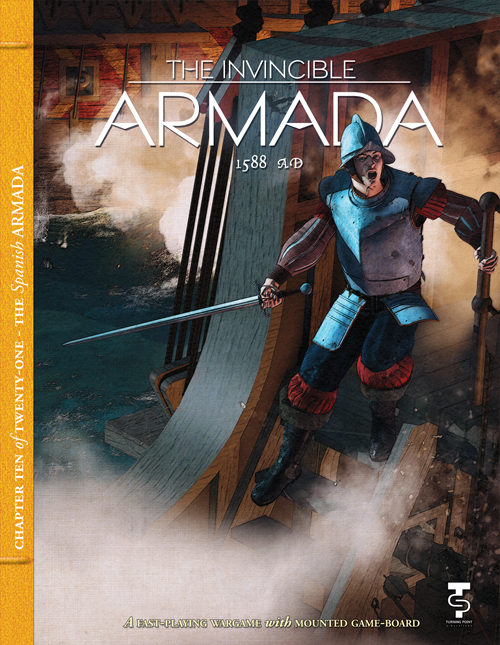 Author and award-winning Game Designer Mark McLaughlin brings us a look at the Armada situation with genuinely break-through mechanics. Players will use both a Strategic and a Tactical map. There are very few physical counters in play but many information chits and dozens of "Event Chits" that influence play. 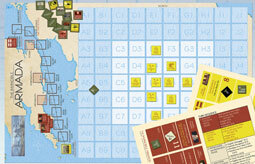 With full color maps and die cut counters, the game allows players to examine different operational plans, and includes a series of optional rules that highlight how various historical changes could have tipped the balance either way. Players can open this game in the expectant hope of a challenging good time! About the Designer: Mark G. McLaughlin is a professional free-lance writer and game designer whose works include War and Peace, Holy Roman Empire, Viceroys, The Napoleonic Wars, Welling- ton, and Rebel Raiders on the High Seas. 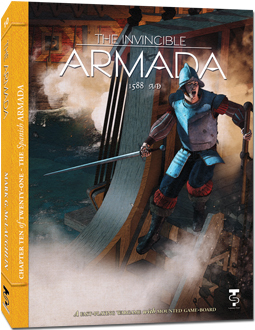 The Invincible Armada is his 15th or so published design. Mark is also the author of two non-fiction books, Battles of the American Civil War and The Wild Geese - The Irish Brigades of France and Spain , and the science fiction novel, Princess Ryan's Star Marines (which is based on his game of the same title, and is named after his daughter). Mark also paints and games with miniatures, a love of which he has passed down to his son, Campbell, an animator and artist who is a far better painter than his father. Mark lives in New Hampshire with the love of his life, his wife of nearly 40 years, Cheryl.